Only a day after new Moon, this stunning twilight display graced the skies over southern California. 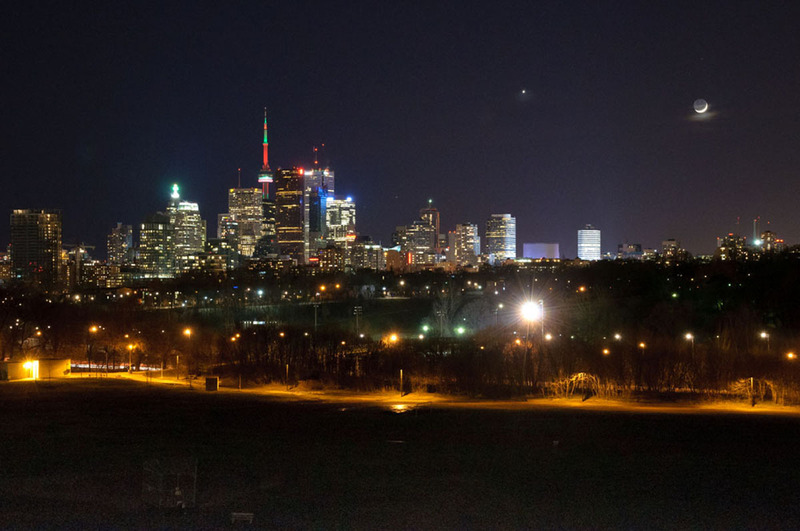 The crescent Moon and Venus were only about two degrees apart – about the length of your thumb when held at arm's length. The dark side of the Moon -- the region where lunar sunrise had not yet happened -- was plainly visible as “earthshine” or “ash light.” Illumination still comes from the Sun but indirectly, having first reflected from the Earth to the Moon and back again to our eyes. 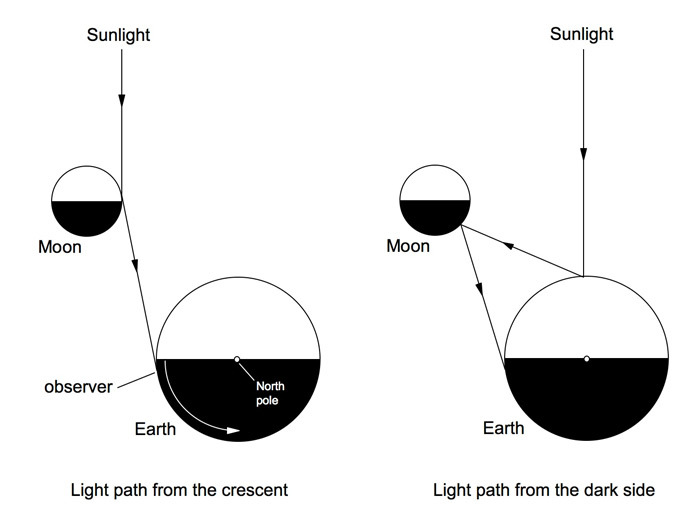 When we see the crescent phase of the Moon, we’re seeing sunlight reflected directly from the Moon –- see the light paths in the diagram. Note that the Sun has just set and the Earth’s rotation has carried the observer to the dark side of the Earth. Light from the dark side of the Moon has taken a different path. Sunlight first reflects off the sunlit side of the Earth and onto the dark side of the Moon. It is again reflected from the dark side of the Moon where we see it as earthshine, the ghostly illumination of the lunar dark side. Earthshine brightness varies from month to month depending for the most part on the cloudiness of the sunlit side of the Earth. If it’s mostly clear, relatively little light reflects off the Earth and earthshine is faint. 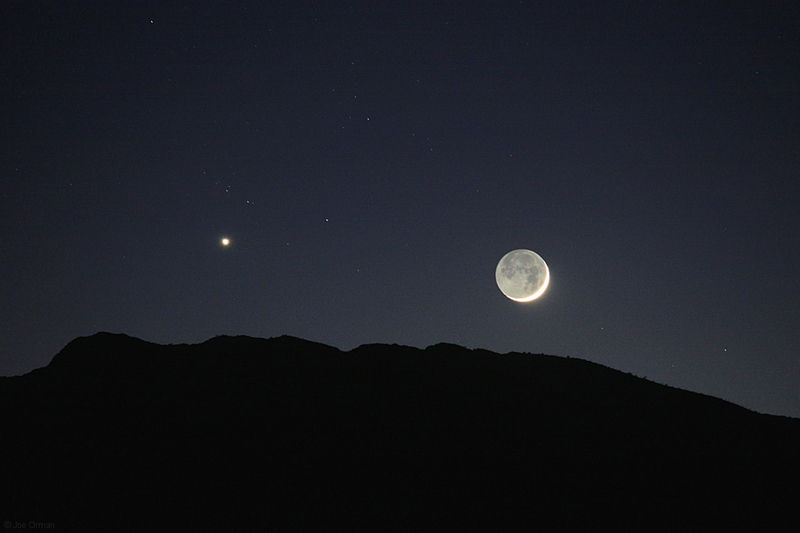 If it’s cloudy, a great deal more light is reflected and the Earthshine is brighter and easier to see in the twilight. Note that on the diagram, Earth and Moon size and separation are not to scale. In the close up of the crescent Moon, the isolated mountain peak at the lower left is just high enough to still be illuminated by sunlight.